Awareness - this one word which I felt I had taken it for granted for quite sometime now. And some days back this is what I realized. We all are aware of what is 'happening' outside us, right? Someone is reading, someone is talking, walking, shouting etc. At the same time, there is something always 'happening' inside us; inside our body-mind consciousness. Are we aware of this? To experience awareness, we need to experience the 'happening' first. There is something happening inside us all the time. Say when we are angry, there is some thing happening inside; when we are happy there is something else happening; when we are feverish, there is something else. The way we act or react to anything is because of this phenomenon of 'happening'! The whole consciousness is nothing but an 'happening'. It is fully dynamic, not even one moment of dullness! And there are multiple factors which influence this 'happening' inside us; like food, friendship, sadhana, seva, satsang, planetary positions etc. Can we become aware of this happening? Once we become aware of this, there is an immediate disconnect between 'YOU' and your body. We become a sakshi(Observer) to what is happening. The whole life can be spent in just being aware of whats happening all over. And this helps in willingly making changes to how we feel and act. For e.g. when we feel lazy, the moment we realize that - "Oh, I am feeling lazy. This is what laziness is". Thats it, that very moment we can take a rational decision and come out of that. But now, is this awareness also a 'happening'? I believe so! What do you feel? It was KK's birthday on the 29th of Oct. Some pics. I was reading the book - 'Be As You Are - The teachings of Sri Ramana Maharshi' by David Godman. Its a compilation of various topics on which Bhagwan Ramana has spoken about. I was interested to read about what has he said about the 'GURU'. It was a pleasant surprise that his words send out the same message as Guruji! There was one phrase on silence which struck me deep. Ramana - "Again, how does speech arise? First there is abstract knowledge. Out of this arises the ego, which in turn gives rise to thought, and thought to the spoken word. So the word is the great-grandson of the original source. If the word can produce an effect, judge for yourself, how much more powerful must be the preaching through silence". After reading this, I fell silent. In the last one and half years with Art of Living, I have been involved in Seva. Be it of any kind - getting registrations, organizing talks, arranging the venue, transport and others. Initially I did it for the fun aspect. But as I got involved more and more, my mind started demanding attention and respect. "I have done so much, but this person X is not doing anything" - is a common phrase that pops up in my mind probably the words are different but the underlying feeling is the same. Recently I asked myself this question - What exactly is happening? or more precisely - Why am I doing this? Apart from all the 'philosophical' answers, I was left out with only one reason - I was expecting something from all of this!!! OMG! Such a big mistake!! It was just becoming like another job! I realized that Seva should happen because 'I am happy and contented' and not because 'I will get something out of it'. If I do anything from the space of happiness, it doesn't affect me if the other person is doing or not or if the results turn out to be good or not. I believe this is a very important lesson in my life. I want you all to look back and ask yourself this question - Are you doing seva or just another job? P.S - I am using the word 'we' since I have observed this happen with almost everyone. 1. We listen to some knowledge and we understand it to a certain extent. We listen to it again say after 6 months and something clicks. We seem to understand a wee bit more than the last time. Yes? Why does this happen? What change has our conciousness undergone in those 6 months? Has it gained something or has it lost? 2. It is said there is only one conciousness and all of us being a part of it. But then why does someone understand more/less than you after listening to the same knowledge? In this case is there any difference in the conciousness between us? The name says it all. Watch it here. Dwar daya ka jab tu khole, pancham sur mein goonga bole. Andha dekhe, Langda chalkar, pahunche kashi re. Its been about 2 months since I returned from Germany and time has just flown away. I was travelling to a foreign country for the first time and had my share of jitters. Being a vegetarian, I had to take care of what food I eat over there. 'Experienced' people had advised me to be careful because the Germans consider egg and fish to be vegetarian!! So by chance I could end up tasting them. Yuck!! Read up here on the benefits of vegetarianism. But I was also given a lifeline - "If you can cook on your own then you can manage." Cook?! Now that's the word I used to utter when I would pester my mom to prepare something yummy to eat. There were still some days before I left. I decided to learn it all. But as the saying goes - 'Procastrination is the thief of time' and it came true again this time :-)). My mom kept telling me how to prepare some simple, easy to prepare items to eat but i did not lend a patient hearing to her caring words. I also carried some of the 'MTR Ready to eat' stuff, Maggi etc which I could use over there. 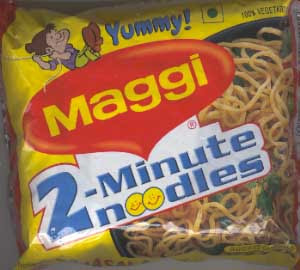 The Maggi and the Ready to eat stuff disappeared into my stomach within a few days. And here came the crucial phase where I had to cook. I avoided cooking by having food either in the office canteen or outside on some days. Got bored of it since most of it would not satisfy my taste buds and they were also very unsattvic. After some days one of my friends also joined me. Together we prepared a keralite special item called the Avial. It came out really superb. You can see the colourful item below. Since he had a big hand in preparing that, I don't remember the recipe. :-( You can read it up here. The experience of cooking together was great. Now I feel like I can manage wherever I go. But its very important for each and everyone of us to know cooking whether be a bachelor or a married person.